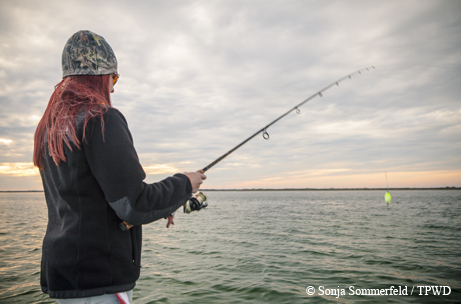 ﻿﻿﻿﻿﻿﻿﻿Practice makes perfect when you’re in pursuit of fish. The cast that’s best is the cast that catches a fish. OK, we all know it’s a little more complicated than that. Keep in mind that no perfect method or formula or fancy equipment can come close to the benefit of understanding fish habits, aquatic structure and ecology. Good casting is important, however, so let’s discuss some basic fundamentals so you can practice. 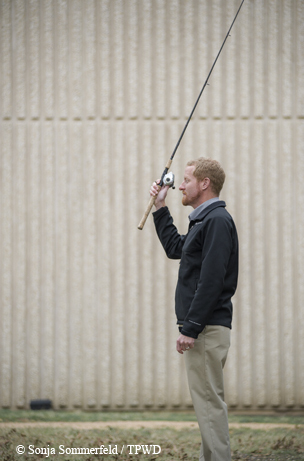 Don’t wait until you’re out on the water to learn to cast. 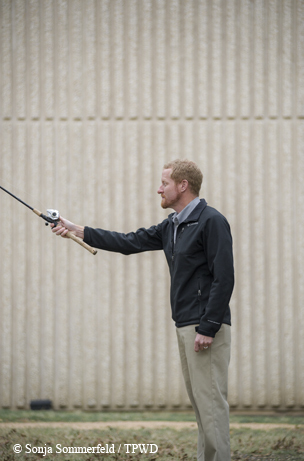 Get a hook-less casting plug, go out into the yard, set up some targets and have fun. Kids especially benefit from this yard practice to build skills and confidence. Bonus: They really enjoy it! Sometimes it works, but sometimes it doesn’t go so well. Here are a few ways casting can go wrong. • The lure smacks the ground pretty close to you with a lot of force. Cause: Not letting go of the button or line soon enough, or swinging the rod too far down. • The lure flies high up in the air or lands behind you. Cause: Letting go of the button or line too early. • The line “backlashes” or gets tangled in or around the reel. Cause: The lure is too light for the rod or there’s too much energy in the cast. Slow down and take it easy. 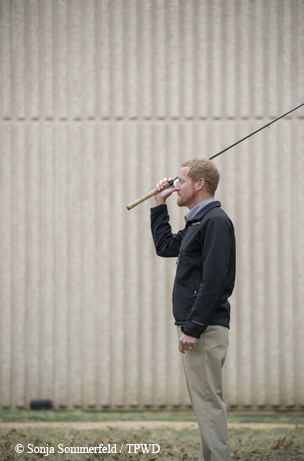 Once you can perform a basic cast, you can work on other goals such as distance and accuracy. Just don’t forget that there’s a lot more to fishing than casting. Here are some easy steps to make a basic cast. 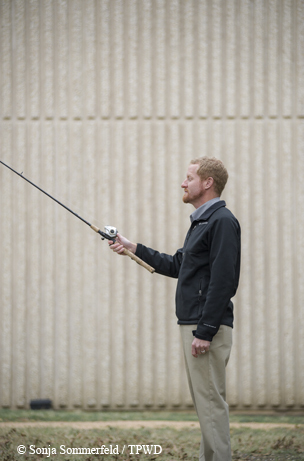 Start by reeling the lure or weight to within an inch of the tip of the rod. Aim at a target about 20 feet away. 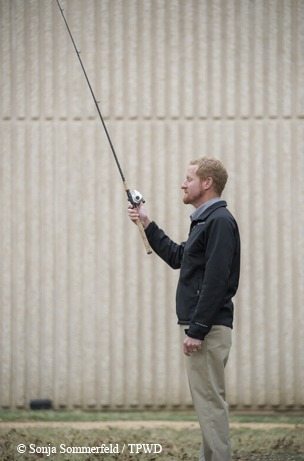 With the rod in front of you, angled up at about 45 degrees, press and hold the button. Note: If using a spinning rod, open the bail and hold the line with your index finger; if using a baitcaster, push the button and hold the spool with your thumb. Start the back cast by swinging the rod behind you, using your wrist and elbow, not your shoulder. This “loads” the rod as the rod bends backward with the weight of the lure. Without stopping, begin the front cast by swinging it back to its original position. Try to make this only slightly more powerful than the back motion. Let go of the button or line just before stopping at the 45-degree angle. Strength doesn’t matter as much as timing. The rod should be pointed up in the air, not down at the ground or at your target.